Mr Daniel, a longtime chieftain of the Peoples Democratic Party, said in a letter to the party's chairman, Uche Secondus, that he abandoned politics after realising that he had reached the peak of his career. Mr Daniel regained political prominence in 2017 when he ran to be national chairman of the PDP. Even though he ran some of the sturdiest campaigns at the time, he ultimately lost to Mr Secondus at the party's national convention in December 2017. Although Mr Daniel shared the sentiments of other Yoruba politicians who alleged widespread injustice and conspiracy in the convention's outcome, he soon re-emerged as the main man of Mr Abubakar's presidential exploratory panel in early 2018. In May 2018, Mr Abubakar confirmed widespread expectation and named Mr Daniel his campaign director. But following Mr Abubakar's victory at the presidential primaries in October 2018, Mr Daniel was dropped as the director general, replaced by Bukola Saraki, Nigeria's Senate President. "He was rejected because he is a Yoruba when he contested for the party's chairmanship," an associate of Mr Daniel knowledgeable of the discussion that preceded his resignation from the PDP told PREMIUM TIMES on Saturday. "Then he was humiliated by being removed as the DG of campaign shortly after securing the presidential ticket." Kola Ologbondiyan, a spokesperson for the PDP, told PREMIUM TIMES Saturday afternoon he had not seen Mr Daniel's letter to the party, and would, therefore, not be able to comment. This is to inform you of my intention to resign from active and partisan politics with effect from today, the 14th day of March, 2019. My decision in this regard is entirely personal to me and having served in various capacities, including as Governor of Ogun State, I have resolved to immerse myself in some other vocations and take on some new challenges. Otunba (Engr.) 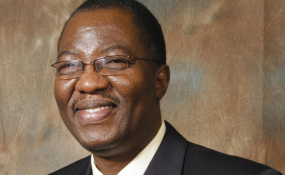 Gbenga Daniel, FNSE, FNAEng Governor of Ogun State (2003-2011).